1. Bobcats lose the Hawks, 102-97, Friday night at the Cable Box. AP story here, box score here. Cats fall to 19-30 and 3.5 games out of the 8th playoff spot. Extremely disappointing loss, especially considering that the Bobcats were at home and the Hawks were playing without Joe Johnson. 2. This is truly the tale of two halves. The Bobcats came out strong in the first half, leading by as many as 17 and getting solid contributions from Raja Bell, Emeka Okafor, and Cartier Martin. Mo Evans, who had hit a buzzer-beating 3 to end the first quarter, hit another one to end the first half and cut the Hawks deficit to 12, 55-43. But the Hawks turned things around in the third behind a bunch of Marvin Williams free throws and sweet shooting by Bibby and Evans. They took the lead briefly at the end of the third, and then for good early in the fourth. While Marvin Williams kept pouring in free throws, The Cats struggled to get anything going on offense. 3. In the end, though, the Bobcats still had a chance. Down just 3 with 35 seconds left, the Bobcats got the ball back after Marvin Williams leaned in too hard while trying to screen Raymond Felton. Larry Brown called a 20-second timeout to set up a play, then sent Brown, Felton, Martin, Diaw and Okafor to the floor for the final moments. Shannon Brown had the task of inbounding the ball, but threw it away, wasting the possession. From my vantage point, the first option on the inbounds pass was to Felton; however, Felton did a poor job rubbing his man off on a screen, and was too closely guarded for Shannon to get him the ball. Diaw then made a move to get open, but it wasn’t a particulary decisive cut. Shannon tried to lead him, but ended up throwing the ball to empty space, where Josh Smith snagged it. This goes down as a Shannon Brown turnover, but it was really a sloppy, terrible play by all involved. But wait, the Hawks would give the Cats still one more chance, as Bibby missed a potentially game-clinching jumper with 14 seconds left. Down three with under 10 seconds left, Shannon Brown inexplicably passed up any chance at getting a three and drove the lane. Josh Smith was shadowing him, and swatted away the already pointless shot. 4. One thing that isn’t mentioned in the AP story, but certainly deserves mention, is that Raja Bell left the game late in the third with what looked to be a groin strain. Despite not returning in the fourth quarter, he still ended the game as the Bobcats leading scorer, and the Cats looked pretty lost on offense without him. It’s pretty bad when losing Raja Bell results in your offense grinding to a halt. 5. 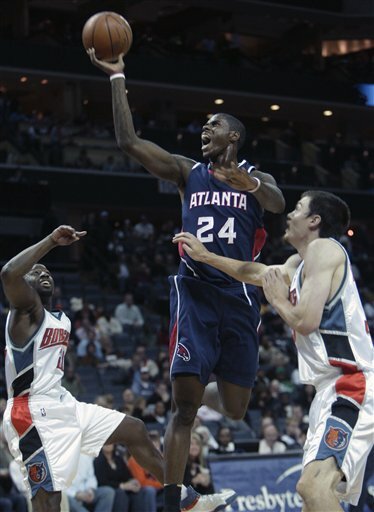 Marvin Williams was a beast tonight. Both Morrison and Diaw spent a lot of time guarding him, and both were unable to stop him from getting to the hoop and drawing fouls. He finished with 29 points on 18-20 FTs. 6. For the Bobcats, Okafor was a monster on the boards, grabbing 19 total (6 offensive). He also went for 15 points on 6-11 FGs, but most of those came in the first half — none came in crunch time. 7. DJ Augustin was back in uniform after missing 10 games with an abdominal strain, and looked rusty. He hit a couple of threes, but missed 6 other shots, committed a couple of bad turnovers, and only logged 16 minutes. Let’s hope DJ can get back into a groove quickly. 8. Cartier Martin was the man for a stretch at the beginning of the second quarter, getting 10 of his 11 points in a 4 minute burst. He also had a nice assist to Gana Diop during that run. The guy has promise; I would expect the Bobcats sign him for the rest of the year when his second 10-day is up. Cartier Martin is going to get every chance to prove himself now that Morrison and Shannon Brown are gone and Raja is out for two games. Looking forward to seeing what he can do against D-Wade and the Heat.